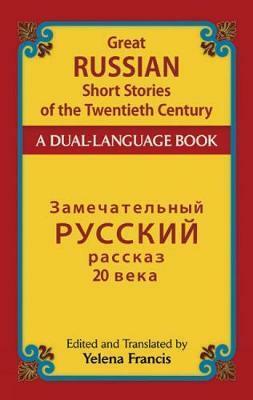 This dual-language anthology presents fifteen compelling tales in a unique survey of twentieth-century Russian short fiction. Featuring the original Russian on the left-hand page and new English translations on the right-hand side, contents include "The Fugitive" by Vladimir A. Gilyarovsky, "The Present" by Leonid Andreev, "Trataton" by Dimitry Mamin-Sibiryak, "Life Granted" by Aleksandr Grin, and "Icarus" by Stepan Skitalets, plus stories by Vasily Grossman, Aleksandr Kuprin, and others. No further apparatus or reference work is necessary for the self-contained text. Appropriate for high school and college courses as well as self-study, this volume will prove a fine companion for teachers and intermediate-level students of Russian language and literature as well as readers wishing to brush up on their language skills. St. Petersburg native Yelena Francis is a Professor of Russian Studies who has taught at the Russian-American School and Washington University in St. Louis.